U.S. Homeland Security Secretary Kirstjen Nielsen, who became best known for defending President Donald Trump's policy of separating migrant children from their parents, said on Sunday she was leaving her position effective immediately. Nielsen's departure was first reported by CBS News. A senior administration official said Trump asked for Nielsen's resignation and she gave it. Trump said on Twitter: "Secretary of Homeland Security Kirstjen Nielsen will be leaving her position, and I would like to thank her for her service." Nielsen, 46, had been DHS secretary since December 2017. Her time overseeing the sprawling department included conflict with Trump and overseeing a policy of separating children from their immigrant parents at the border with Mexico. Trump has made a clampdown on illegal immigration a centrepiece of his two-year-old presidency, as he has sought to cut back on the number of newcomers, especially Mexicans and Central Americans, entering the United States without proper documentation. Nielsen's departure was announced two days after the Republican president abruptly said on Friday he was dumping his own nominee to be the top officials at U.S. Immigration and Customs Enforcement (ICE), Ronald Vitiello, saying he wanted someone "tougher." ICE is under the jurisdiction of DHS. Trump insists that the arrival of immigrants across the southern U.S. border constitutes a national emergency so important that he sidestepped Congress' refusal to provide him with several billion dollars he requested to build the border wall. He said in a statement, however, that she should not serve as a scapegoat, blasting Trump for "terrible and cruel policies." Noting that the department now has neither a permanent secretary nor deputy secretary, he called on the administration to work with Congress in good faith to keep the country safe. The Trump administration adopted the policy of separating migrant children from their parents early last year as part of its "zero tolerance" approach to illegal immigration, intended to deter families from leaving home in the hope of entering the United States. After domestic and international criticism, Trump signed an executive order in June ending family separations, but a government report last month showed that more than 200 children had been taken from their families since that time. Trump recently threatened to close the border with Mexico, or parts of it, if Congress did not change U.S. laws to fix what he called immigration "loopholes." Nielsen's departure has been rumoured repeatedly. News reports said Trump had belittled her in Cabinet meetings, unhappy with her efforts to tighten immigration. 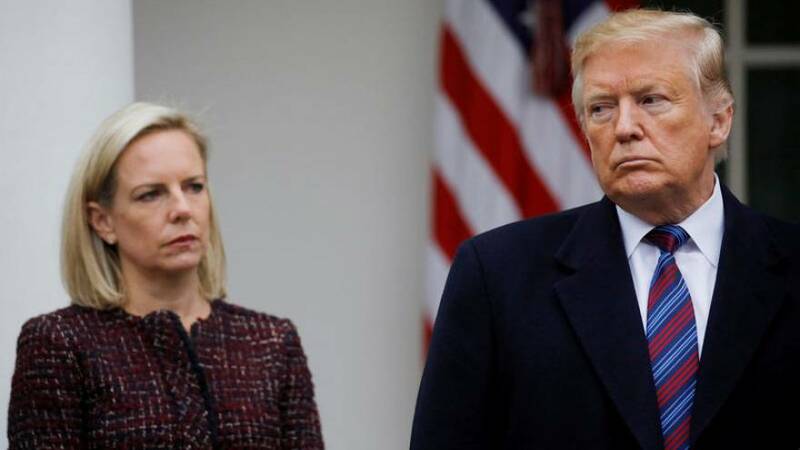 The New York Times reported nearly a year ago, in May 2018, that Nielsen was close to resigning after Trump berated her in front of other Cabinet secretaries over increases in the number of immigrants crossing illegally from Mexico.